On Thursday, law enforcement arrested Gregory Bush, who tried to shoot up a black church, couldn't get in, and so moved onto a Kroger grocery store and killed two black patrons in cold blood while pointedly sparing a white patron. On Friday, it was Cesar Sayoc, who was charged with sending mail bombs to a bunch of folks who just so happen to be targets of Donald Trump's criticism. And on Saturday, it was Robert Bowers, who entered a Pittsburgh synagogue on Saturday and, amid a torrent of anti-Semitic hate speech, went on a rampage that left 11 people dead from gunshot wounds. That marks three days in a row, then, that an angry, middle-aged man committed a violent crime that certainly appears to have been encouraged, in part, by Donald Trump's decision to turn the bully pulpit into a bully's pulpit. In Bowers' case, he claimed on Gab (aka, the alt-right Facebook) that he did not vote for Trump because the President is too much of a globalist, and not enough of a nationalist. However, he did embrace much of the Donald's rhetoric. Further, what spurred Bowers to take violent action was his belief that Jewish folks—specifically the Hebrew Immigrant Aid Society, which gives aid to refugees—were plotting to sneak the caravan of immigrants from Central America into the United States. "HIAS likes to bring invaders in that kill our people," Bowers wrote on Gab just hours before the shootings. "I can't sit by and watch my people get slaughtered. Screw your optics, I'm going in." Trump, of course, has spent weeks trying to drum up fear and anger centered on the caravan. "We should stiffen up our laws in terms of the death penalty." "It looks definitely like it's an anti-Semitic crime." "If there was an armed guard inside the temple, they would have been able to stop him." "You wouldn't think this would be possible in this day and age, but we just don't seem to learn from the past." It is, as you might have guessed, a trick question. He said all of these things, which means that he opined, with a straight face, that churches really ought to arm themselves. The fourth point is actually a very good one, although at the same time rather tone deaf, since certain members of "we" have an unusually difficult time learning from our past mistakes and not repeating them. This was a rough, rough day for all of us. This evil anti-Semitic attack is an assault on all of us. It's an assault on humanity. It will require all of us working together to extract the hateful poison of anti-Semitism from the world. The scourge of anti-Semitism cannot be ignored, cannot be tolerated and cannot be allowed to continue. The problem, as always, is that he doesn't mean any of it. It's true that politicians often say what they think they have to say, even if they don't mean it. But most of them, at least, offer up their "thoughts and prayers" (or whatever other empty rhetoric) and then wait a day or two before going back to talking about how important gun rights are, and how we can't ban bump stocks, and the like. In Trump's case, within 15 minutes of lamenting violence and anti-Semitism, he was back to slurring Maxine Waters, and "Pocahontas," and the media, and watching approvingly while the crowd chanted "lock her up" after he took a few potshots at Hillary Clinton. The nonpartisan Cook Political Report has been doing seat-by-seat House projections for years, and is the gold standard in this type of analysis. CNN is a newcomer to the party, and has only gotten serious about seat-by-seat projections this year. Nonetheless, both see similar things going on this week, namely that the Democrats' enthusiasm gap is fading a little, and Donald Trump's popularity is improving a little. Despite these things, both outlets see most of the momentum this week headed in the blue team's direction. That's a total of eight seats moving in the Democrats' direction and two in the Republicans' direction. Overall, Cook has 182 safe seats for the Democrats, and only three of their seats in danger, compared to 142 safe seats for the GOP, and 46 of their seats in danger. That's a total of nine seats moving in the Democrats' direction and two in the Republicans' direction. Overall, CNN has 187 safe seats for the Democrats, and six of their seats in danger, compared to 153 safe seats for the GOP, and 59 of their seats in danger. Rep. Keith Ellison (DFL-MN) was, not long ago, among the more prominent Democratic standard-bearers in America. A darling of progressives, he made a serious run at the DNC Chair's seat before losing to Tom Perez and being appointed the Party's #2 pooh-bah. Then, he decided to leave Congress and take a shot at the Minnesota attorney generalship. That would generally be considered a step down, but being AG in a blue state presents a chance to become a leader of the Trump resistance, and so to be much more high-profile than one of 400+ members of Congress. The system by which propositions are added to the ballot in California is a little wonky, and is open to exploitation by folks who have a couple of million dollars to burn gathering signatures. The state GOP decided that this was their chance to keep Election Day from being truly ghastly. And so, they cooked up Proposition 6, which would repeal the state's gas tax (which is used to pay for infrastructure improvements). The motivation was not the tax, per se, but instead to get anti-tax Republicans to the polls. It's a variant of the "gay marriage" ballot propositions used to great effect by George W. Bush elections guru Karl Rove. Endorsements probably don't matter much these days, but a high profile withdrawal of an endorsement might. That's what happened to Rep. Kyrsten Sinema (D-AZ) this week in her race against Rep. Martha McSally (R-AZ) for Sen. Jeff Flake's (R-AZ) seat. The Arizona State Troopers Association pulled their support after members objected. It is becoming close to a certainty that nobody will collect 50% of the vote in the race between Sen. Cindy Hyde-Smith (R-MS) and Mike Espy (D), given that Mississippi law calls for a jungle primary when a senator vacates his seat (as Thad Cochran, R-MS, did), which means a bunch of candidates on the ballot. The runoff will be on Nov. 27. Hyde-Smith has refused to debate Espy thus far, but says she is open to doing so if they do end up in a runoff. The race between Rep. Marsha Blackburn (R-TN) and Phil Bredesen (D) to succeed Sen. Bob Corker (R-TN) has attracted $70 million, which is far and away a record for any election of any sort in Tennessee. The majority of the money came from outside the state. Sen. Ted Cruz (R-TX) opined that the current tone of American politics concerns him, and that, "The anger, the rage, the personal attacks and nastiness—that's not good for our country." His words would carry more weight if he had ever run a single campaign that was not rooted in constant negativity, and if he had not appeared hand-in-hand on stage with Donald Trump just four days ago. The year's most popular Halloween costume in Utah? Mitt Romney. Donald Trump has become the central issue in the Connecticut Senate race. Since the President is 17 points underwater there, it means Sen. Chris Murphy (D-CT) is quite pleased at that turn of events as he tries to get reelected. Sen. Doug Jones (D-AL) and Sen. Kamala Harris (D-CA) are both campaigning in Florida for Sen. Bill Nelson (D-FL). Those are two very different kinds of Democratic senators, our guess is that they aren't visiting very many of the same places. As he tries to unseat Nelson, Gov. Rick Scott (R-FL) keeps doing "gubernatorial" things in an effort to look strong and decisive. The latest: ordering policeman to add churches and temples to their patrols following Saturday's shooting in Pittsburgh. Missouri AG Josh Hawley (R), who is neck-and-neck with Sen. Claire McCaskill (D-MO), apparently got the latest copy of the GOP playbook from the White House, because he's blaming the MAGA Bomber's actions on...Hillary Clinton. Donald Trump has held three rallies in Montana, and hasn't moved the needle much in favor of Matt Rosendale (R), who is sinking in the polls in his race against Sen. Jon Tester (D-MT). The President has thus concluded that there's only one thing to do: Hold a fourth rally. As noted above, the Cook Political Report moved a bunch of House races this week. They also moved New Jersey's Senate race from "Leans Democratic" to "Toss-up." After all, both candidates are corrupt. Still, New Jersey is a blue state, so in the end, more people are likely to go for "our corrupt candidate" than "their corrupt candidate." Sen. Kirsten Gillibrand (D-NY), seen as a serious contender for the blue team's 2020 presidential nomination, promised that she won't shoot for the White House in 2020, and that she will serve her full term. Of course, Sen. Elizabeth Warren (D-MA) made the same promise about three months ago, and has already pretty much forgotten it. Since he voted for Brett Kavanaugh, Sen. Joe Manchin (D-WV) has seen his polling numbers go up, up, up. We've done a number of frontrunners or near-frontrunners in the past month or so, now let's do someone who's a somewhat longer shot. As always, the pros and cons refer to the general election, and not the primaries. Background: Born in New York, McAuliffe has politics in the blood, as his father was a county-level Democratic functionary and his mother a frequent volunteer for the Party. He showed an entrepreneurial bent from an early age, starting a driveway-resurfacing business at 14. After taking his BA at Catholic University and his law degree at Georgetown, he started a law firm, a bank, and an investment business in short order. Through these entities, mostly his investment business, he is now a millionaire many times over. Political Experience: McAuliffe started his rise up the ranks of the Democratic Party very early. He jumped on board the S.S. Jimmy Carter at a time when most folks saw the peanut farmer as nothing more than a hick from the backcountry, and at 23 was named the campaign's national finance director. Given his moneymaking skills, he performed brilliantly in the job, returning to his business career after the election, though also helping the Democrats to raise funds whenever needed. He expanded his business and political networks simultaneously over the next decade-and-a-half, bragging that he had over 18,000 names in his Rolodex, and eventually became close with another promising Southern politician that other folks wrote off a bit too quickly. When Bill Clinton officially entered the 1992 presidential race, he put McAuliffe in charge of fundraising, and then in 1996 made him co-chair of the reelection campaign. 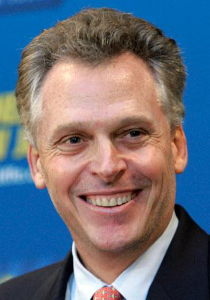 In 2000, McAuliffe was elected DNC chair, serving four years. He took a shot at the Virginia governor's mansion in 2009, came up short, and then prevailed on his second attempt in 2013, serving one term that ended in January of this year. Signature Issue(s): Healthcare. McAuliffe was tooting the "Medicare for All" horn before just about everyone. When his efforts to expand Medicare and Medicaid in Virginia were stymied by GOP legislators, he announced a plan called "A Healthy Virginia," which tried to achieve as much as possible through regulatory changes and executive orders. Instructive Quote: "I've met all of my business contacts through politics. It's all interrelated." Completely Trivial Fact: McAuliffe once wrestled an alligator in exchange for a $15,000 donation to the Carter campaign. It even made the pages of Life magazine. Recent News: McAuliffe has been campaigning vigorously for Democratic candidates this year, particularly those who happen to be running in Iowa, South Carolina, and New Hampshire. While appearing in the latter state this week, a new PAC "coincidentally" announced its existence. Called "Tenaciously Moving for American Change in 2020" (or TMAC, a play on his nickname), its stated purpose is to convince him to run. Three Biggest Pros: (1) He won't have any problems raising piles of money; (2) Three of the last four Democrats to win a presidential election were Southerners, and if he can somehow get a sizable vote in that region (enough to take Virginia, North Carolina, and ideally Florida and Georgia), he would effectively be rebuilding the Obama coalition but with a different blueprint; and (3) When it comes to presidential campaigns, he knows how the sausage is made better than just about anybody. Three Biggest Cons: (1) McAuliffe is a great "behind the scenes" guy, but is about as bland and vanilla as it gets when he's out in front, and he won't get voters excited; (2) Given his view that the line between politics and business is blurry, there are quite a few questionable moments in his past in which the flow of money may not have been 100% kosher; and (3) Someone who is intimately connected with the Clintons, but does not have Bill's charisma or Hillary's encyclopedic knowledge of policy and foreign affairs, would seem to be the worst of both worlds for the Democratic Party. Is He Actually Running? : He is certainly doing everything he needs to do to keep the option open. And it's a fair question whether the new PAC was organized for his benefit, or was organized by him. Betting Odds: The books are giving between 50-to-1 and 40-to-1, which implies a 2% to 2.5% chance of landing the nomination. The Bottom Line: It's a long shot, surely longer than the odds imply. If the Democrats really want a bland white guy from Virginia with ties to the Clintons, then they should at least go with one who speaks Spanish and pick Sen. Tim Kaine (D-VA). Oct24 What Happens the Day After? Oct23 Trump Rallies With Cruz, Calls Himself "Nationalist"
Oct22 Whatever Happened to the California GOP?